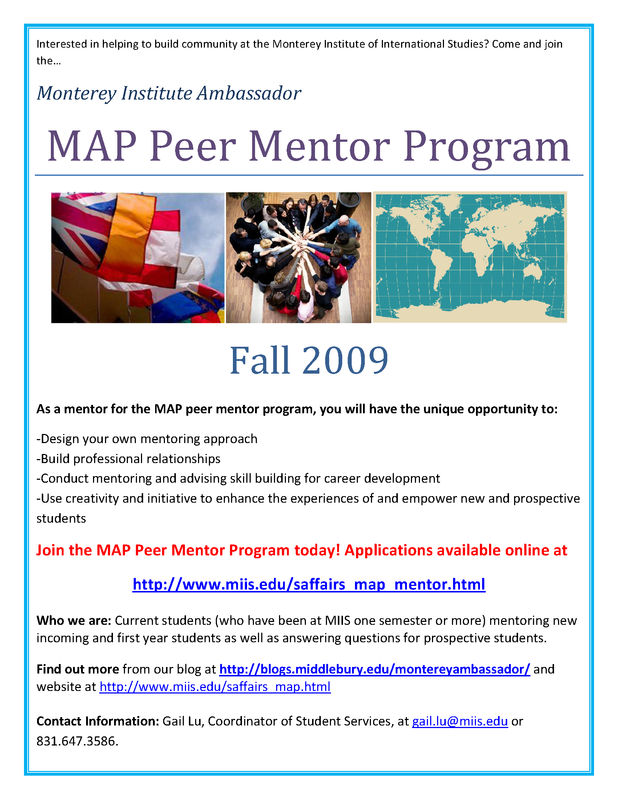 The MAP Peer Mentor Program is looking for mentors for the Fall 2009 semester. We have many new students coming this fall, please take advantage of this exciting opportunity to be a peer mentor by applying online at http://www.miis.edu/saffairs_map_mentor.html ! Even though we’ve just begun Fall 2008, the MAP Peer Mentoring Program is already accepting applications for peer mentors for Spring 2009. Therefore if you are interested in becoming a mentor for the MAP Program for Spring 2009, please apply here! Please note: If you are currently a mentee in our Fall 2008 program, once you have completed one semester here at MIIS, you will be eligible to be a mentor.